For every door that’s life has run out, there’s another waiting to take its place. Seriously, come see all of the awesome doors that you can use to replace your old one that’s ready to break off at the hinges. But don’t replace it with just any old door. Make sure you’re replacing it with a door of quality. Here at Blue Springs Siding & Windows, it may not say it in our name, but we know all about what makes a quality door. That’s why we only carry the best in the business. 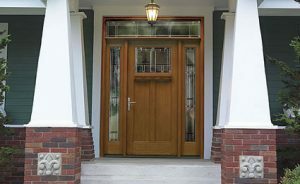 Here’s our guide to finding the perfect replacement door for your Kansas City home. Therma-Tru Entry Doors are a safe, and durable option for any home. They also deliver beautiful entry doors, so you’ll never have to sacrifice function for style. Therma-Tru fiberglass entry doors are beautifully crafted to be just as strong as steel doors, but without the risk of as much wear. These doors are highly durable, hard to dent and scratch, and hold up well against the elements. Along with superior strength, you’ll get many style options, such as architectural features like solid wood square edges, architecturally correct stiles, rails and panels. Your entry door is a very vulnerable place in your home when it comes to energy efficiency. All those nooks and crannies give air the opportunity to slip in and out of your home creating drafts. This can affect the overall comfort level of your home as well as make your energy bills skyrocket. But you’ll never have to worry about that with Therma-Tru entry doors. Therma-Tru entry door systems are ENERGY STAR® qualified and NFRC certified which means they are designed to conserve energy. Call Blue Springs Siding & Windows today at (816) 228-5225 for a free estimate on your door replacement.